Cincinnati Public Schools "Summer Jazz Academy"
at Taft High School in Cincinnati !!! There was no cost to the students, but enrollment was limited to 50 Cincinnati, Covington and Newport public school students who just completed 6th thru 11th grade. 10 students signed up the first couple days. All eight days had the same 10am-3pm format, with Masters classes in all primary instruments, music theory, jazz history and ensemble rehearsal every day. Seven Masters classes were taught both weeks, Monday thru Thursday, 10-11:30am in drums, bass, piano, guitar, trumpet, trombone and saxophone, plus four days of vibraphone. 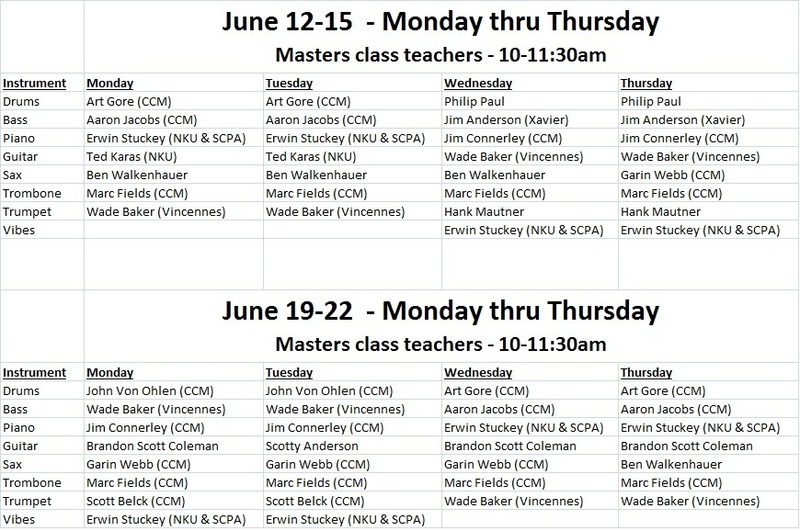 The Masters class schedule is below. Dr Isidore Rudnick, FIne Arts Curriculum Manager for the Cincinnati Public Schools, was Director of the academy. Mike Wade oversaw the Masters classes and Wade Baker helped with Jazz history, music theory and ensemble performances. Our Masters class teachers are below. Check out their biography links. Cincinnati has amazing musicians. Who care about kids.